On July 17, 2017, the West African Examinations Council (WAEC) released the results of the May/June 2017 West African Senior Secondary Certificate Examination (WASSCE) conducted across the West African region, including Nigeria. In the past decade in Nigeria, the release of WAEC results is an exercise few look forward to, because of high failure rates of students over the years. The 2017 statistics, however, shows that 59.22% of students obtained a minimum of credits in at least five subjects, including Mathematics and English. In an examination written by 1,559,162 students, some of whom were not writing the examination for the first time, how to react to that statistic is a matter of personal perspective. This perspective might be helped by learning that the pass rate was 38.68% and 52.97% in 2015 and 2016 respectively. My concern here is not the result itself – which is a manifestation of the travails of the Nigerian students within an educational system that can offer them so much more. My main concern is the perennial emphasis on the number of students “obtaining a minimum of credits in 5 subjects and above, including Mathematics and English” as the benchmark of the health of the outcome. Our current curriculum might just be preparing 21st-century students for the 20th century. Particularly in Information Technology, our secondary school curriculum in its current form does not prepare young Nigerians for our world as it is today. Although students are offered the chance to study Computer studies in secondary school, a combination of an inadequate curriculum, inadequate facilities and a lack of skilled teachers defeats the purpose. Gauging by the quality of students who go on to become university graduates in computer science – majority of whom do not know how to code competently- it can be said that our educational policy on ICTs isn’t working for a sector which is definitely at the core of the modern economy. To be effective, interventions to improve the quality of ICT education and manpower in Nigeria must at the least commence at secondary education. Studies of successful ICT entrepreneurs have shown that it takes about 10,000 hours to master the skills required to build world leading ICT products and services. This can amount to about 5 – 8 years of practice for many people. Nigerian students are not different from the young people in the United States for instance who start world class ICT firms while in university, the latter just had the benefit of a better educational system and the benefit of an early start. Improving classroom facilities, the quality of teachers and the curriculum will contribute to improving the quality of post-primary school ICT education in Nigeria. In addition to improving the quality of ICT education in secondary schools, another avenue the Federal government can explore in improving ICT skills among young people in Nigeria is by collaborating with non-profits who are already working to improve these skills among young people. Paradigm Initiative has, for example, built a record of accomplishment of working with young people in underserved communities to develop their digital skills. Through our LIFE (an acronym for “Life skills. ICTs. Financial Readiness. Entrepreneurship”) program with offices in Ajegunle Lagos, Ngwa road Aba and Dakata Kano, we help improve the livelihoods of underserved youth through ICT skills. Our success stories are numerous and include Martins Olajide, who has created an app that helps young people stay away from the age-inappropriate online content. Through a voice recognition algorithm, it can detect the age of online visitors and shield vulnerable age groups. Brenda Okoro has also created an app called MobiCheck that allows patients to access medical information in real time. Our Echoes from LIFE publication contains the stories of many other stories of young people from underserved communities in Nigeria, who have been connected to opportunities through learning in-demand valuable digital skills. In order to reach more students and make more impact, our LIFE programme is moving into schools across the country and is poised to raise an army of digital perceptive Nigerian youth creating excellent ICT products and services. Due to the scale of the knowledge and skills deficit, every effort should not be spared to improve the lot of a generation who deserve to be apprised not just with “obtaining minimum of credits in 5 subjects and above, including Mathematics and English” but in the quality of their ICT skills, innovations and inventions. Today, on our #EchoesFromLIFE series, we feature Ochuba Paul, of our #AjegunleLIFE Class of 2016C. In Paul’s own words, “After secondary school, I was always home with nothing to do. Just to watch the clock tick, visit friends, visit my mentor in the evening, etc”. Paul spent time helping his dad with his pharmaceutical business and at some point, he was advised to join our LIFE program by his mentor who had nominated others. “All of the training came handy for me but Life Skills and MS Word were most interesting. The training has helped in different ways!” Paul now speaks with confidence. In fact… “I can now face a large audience without fear and I can think through things on my own”. We think that’s awesome, but that’s probably because we saw him at that fateful interview. With new skills and a huge NO to idleness, Paul applied for several jobs, attended many interviews and he now teaches at a primary school. The once bored young man now supports his parents! We continue with our #EchoesFromLIFE series this week, and introduce Gladys Okpeudo. She’s of #AjegunleLIFE Class of 2016. Before the #AjegunleLIFE program, Gladys was “helping my mum in her shop and also doing decoration for wedding ceremonies and other events”. 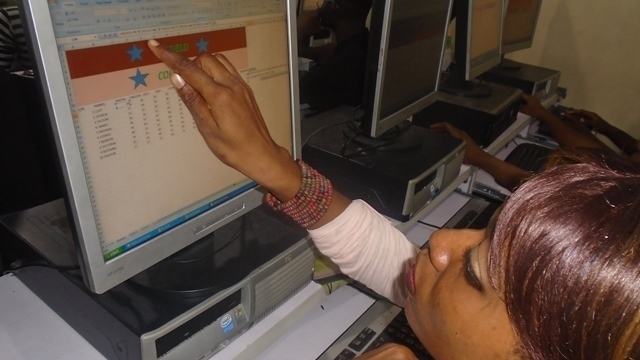 Gladys now works with Favoured Computer Systems in Apapa, Lagos, as a Computer Operator. She no longer adds to the youth unemployment data. Hear her: “With this job, I’ll be able to save to continue with my education in a reputable university where I’ll study event management and finally have my own event management company.” We wish Gladys, today’s #EchoesFromLIFE feature, all the very best! By ParadigmHQ | AbaLIFE, AjegunleLIFE, L.I.F.E. Slums typically suggest scenarios of delinquent youth, carefree parents and/or guardians, and a chaotic society. Ajegunle, the most popular and most populous slum in Lagos Nigeria (with a total land mass of 13.9 square kilometers and a population density of 120,254 per square kilometer), accounts for a significant number of unemployed youth – many of who are involved in criminal activities and various vices such as cyber-crime whose negative impact on the society are high. Considering that majority of these youth lack access to mentors who can guide them, and they also cannot afford to pay for the few opportunities that are often brought to their communities, this is not surprising. The obvious lack of alternative lifestyles is a popular excuse for the young people who have adopted criminal activities as a way of life that promises hopeful deliverance from poverty and inferiority complex. But this is rapidly changing. The L.I.F.E project; a train-the-trainer capacity building initiative uses a relay training model and positive peer pressure concept to transform this notorious slum as a model intervention for other underserved communities. Ajegunle Innovation Centre (AJIC) is run by Paradigm Initiative Nigeria (PIN) in the heart of Ajegunle Community and hosts the L.I.F.E intervention project. L.I.F.E is an acronym that stands for Life Skills, ICTs, Financial Readiness and Entrepreneurship. Following weeks of training in ICTs, the forty applicants (selected every quarter) are also trained on entrepreneurship, financial literacy and life skills and then matched with companies to complete internships or supported to pursue their entrepreneurial interests in order to transform their lives by giving them a chance to improve their livelihoods. These youth, who would not have otherwise had the opportunity to get a job, are equipped with necessary skills and an opportunity to begin a career that may end in the pursuit of their entrepreneurial dreams or positions in the companies where they intern. Azeez walked into the centre one sunny afternoon in 2013 with an unbuttoned shirt and a bare chest. He spoke roughly and looked every bit a typical street boy. But he had one thing going for him – he wanted very badly to learn. The center now receives a number of young people like Azeez on a daily basis, but this hasn’t always been the case. The project has been on since 2007, and initially struggled to get young people into the program due to a low level of awareness and trust. Even when people knew about the opportunity, it was difficult for them to believe that they would not be exploited somewhere down the line. But then, peer pressure is very strong among young people, and just as much as this can translate into negative influence, it can also translate even more to positive influence. The project has raised many role models for these youth of the community. Azeez was influenced by stories of some successful young people within his community who had passed through the project. Stories of youngsters like Famous’, who went on to work in the visa section of the British High Commission in Abuja following his training, earned enough to go back to school and earn a degree, and who now works in KPMG; an international consulting firm spread quickly in the community. There was also Esther, who interned with the United Kingdom Trade and Investment (UKTI) in Lagos and went ahead to become a software developer. Azeez was bent on being empowered financially, getting an education and then moving on to better opportunities. Born into a family with only three surviving children of several, Azeez is the last of them. He readily admits that even within the Ajegunle slum, his family is still considered among the poorest. “Attending primary and secondary school was sheer miracle considering the financial status of my family. To crown it all, my father was unwilling.” He said in retrospect. After his secondary education, Azeez hung around motor-parks, working as an ‘agbero,’ (these are miscreants who hang on public buses, helping the driver to collect fares, sometimes extorting monies from motor-park drivers and also working as political thugs for politicians sometimes). But being admitted into the L.I.F.E program radically changed Azeez’s life. 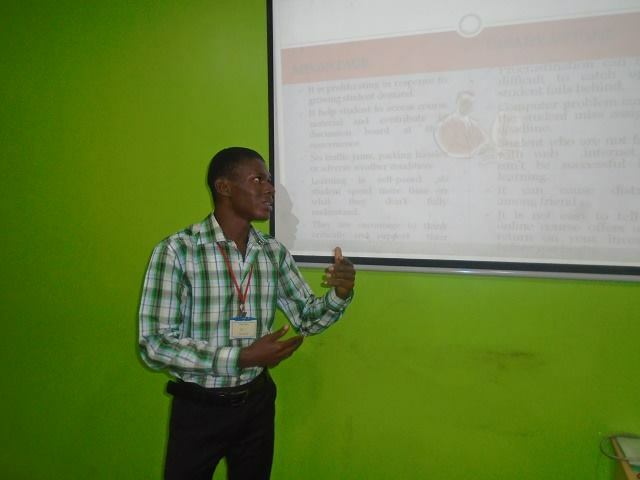 After his training, Azeez was placed on internship with DHL Nigeria by PIN. He worked with DHL for six months. In those months, he was able to take some of his friends off the streets and introduce them to the L.I.F.E program. He used to be one of the most popular street boys and he had his own following. When he completed his training and a small graduation ceremony was held at the community town hall, Azeez’s previously ‘uninterested’ father was present. More parents/guardians are coming into the AJIC, making enquiries, and picking up forms for their wards. An ardent mother once said to us; “You must do for my son what you did for *Mama John!” More young people in Ajegunle are saying ‘no’ to the negative pressures of their peers and criminal activities and are pursuing with passion a proven and wholesome opportunity that includes capacity building, work placement, an opportunity to give back and the overall mission of improving their livelihoods and those of their families. Since leaving DHL, Azeez has taken entrance exams into the university and is now studying at the University of Ilorin, Kwara State, one of the foremost tertiary institutions in Nigeria. At a time when criminal activities (especially cybercrime) among young Nigerians was fast becoming a global identity for the nation, the L.I.F.E project stepped in to provide much needed reform for young people living in underserved communities in Nigeria. The project extended to Aba, Abia State in 2014 and is resident in an equivalent of Ajegunle Community (Ngwa Road), in the Aba town of South-East Nigeria. Baseline Studies are currently ongoing in North-West Nigeria for determining a suitable location for the project in that region. 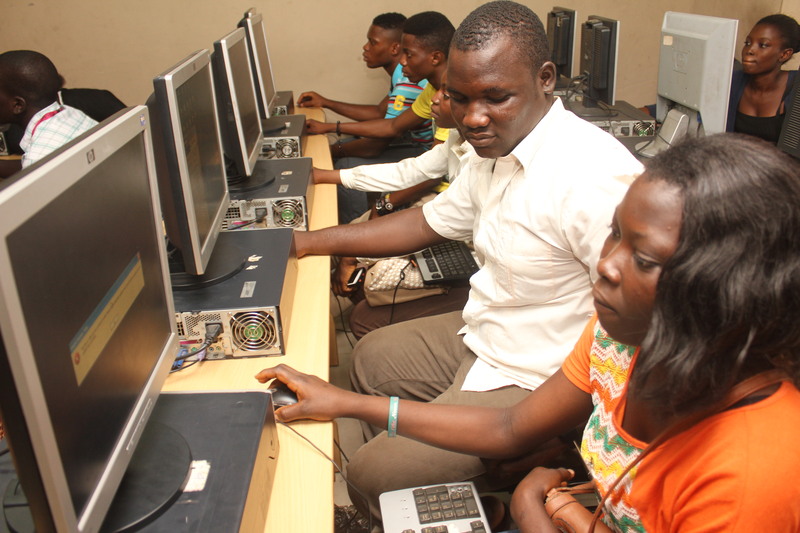 Ajegunle.org is an initiative of Paradigm Initiative Nigeria (PIN), which connects young people with ICT enabled opportunities to create better livelihoods through its ICT, Entrepreneurship and Life skill training. The project now reaches more young people in the community running morning and evening classes – about 40 students every cycle. The ICT classes for the 2014 C session focused on Microsoft Office Packages, design tools & the internet. An highlight of the ICT Training was the research the students had to carry out for their PowerPoint presentation class. 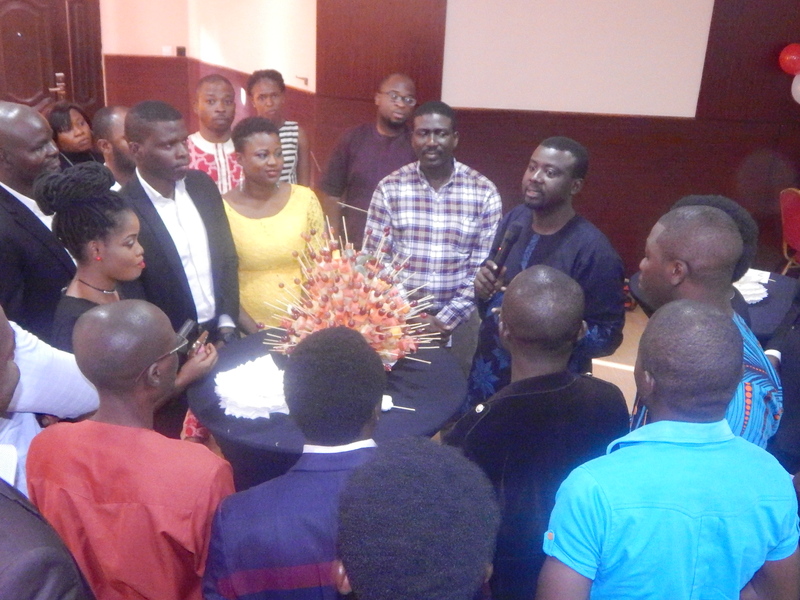 Many of them admitted that it was the most challenging educational assignment they had ever done because they had to research, write creatively, work within a team and make presentations to their classmates, trainers and PIN staff. The Entrepreneurship classes commenced with the Introduction to Entrepreneurship, and it was facilitated by industry experts. The students were trained on Marketing, Finance, Managing Risks, Staffing, Social Impact, Customer relations and Writing Business Plans. Ademola Adeoye, MD Worldclassimpact, Ronald Nzimora, MD Profit Marketing Systems Limited (PMSL), David Ekugum of SESEWA support services and Bola Akeju of Wecyclers were among the facilitators for the 2014 C session . Life skill sessions were taken by Mrs. Oluwaseyifunmi Walter and Rev. Yomi Olufiade. “Before I came in for Ajegunle.org Capacity Building Program, I had big dreams but I was not inspired on my own,” says John-beloved Agwanzenini of his experience at the Ajegunle Innovation Centre (AJIC). Preparations are ongoing for the 2014 Class C session which commences on the 11th August – 26th September 2014. We look forward to touching the lives of 40 more young Nigerians. The Google Web Training at Paradigm Initiative Nigeria gives the youth of the community great advantage in the job market as Google Web Academy offers such skills and certification that are market driven. 16 out of the 36 registered participants qualified for the training. They were trained on Google products like Google search, YouTube, Google Plus, Google email, Google Docs, Spreadsheet, Presentation, Form, Chrome, Internet Safety, Google Maps ,Earth and Map Making. The training lasted three weeks; from 9th June to 27th June. At the end of the training, participants had some two weeks of practice and mapping of specific locations using Google Map maker.